Shravan Kumaran and his younger sibling Sanjay Kumaran are perhaps India's youngest entrepreneurs. 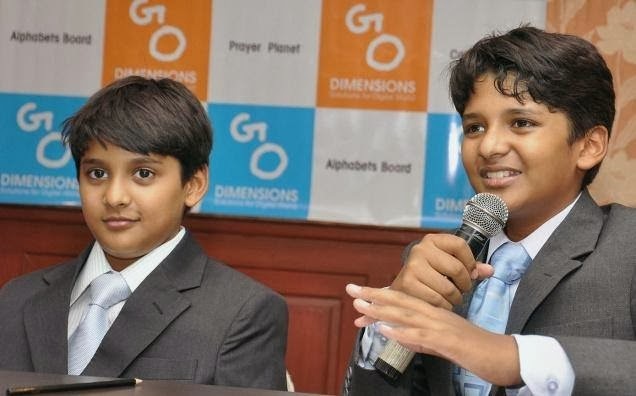 Shravan, 14, is the president and Sanjay, 12, is the CEO of Go Dimensions, an app development unit that they founded two years ago from their bedroom in their home in Chennai. On Saturday, they stood before the 5,500 attendees at an SAP event in Bangalore, and talked about how to ideate, and draw up a business plan. "You should have a strong idea, self-confidence, a good business plan and know about sources of funding," said Sanjay with the confidence that you normally only see in much older professionals. In the past two years the two have developed eleven apps that are available on the Apple App Store and Google's Android Play Store. The apps have received over 35,000 downloads. Their first app - Catch me Cop on the Apple App Store - was released last year and was a hit. That was a game where a con escapes prison and a wide hunt is launched for him. There are chases through a desert, beach and a maze. The boys credit their father Kumaran Surendran, director with anti-virus and security solutions company Symantec, for encouraging them to learn programming and play with gadgets. They learnt QBasic, a programming language for beginners, when Shravan was in his fifth grade and Sanjay in his third grade. They learnt to code on Java by reading books and information available on the internet. Programming on Apple's iOS required a bit of handholding from their dad. The two have previously made presentations at TEDx, and IIM-Bangalore. The brothers are hoping to get at least 50% of smartphone users in India to use their apps.